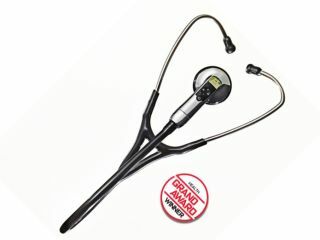 Popular Science has picked a stethoscope as its tech product of the year, with Natal, Wolfram|Alpha, Canon's EOS 5D and Mercedes among the category winners. Wolfram|Alpha picked up the gong for the top innovation in computing for 2009, Canon's EOS 5D Mark II the gadget of the year and 3M/Littmann's Electronic Stethoscope Model 3200 with Zargis Cardioscan took the overall award. Popular Science's top 100 list always garners plenty of attention and the category winners this time also include Mercedes for its S400 BlueHybrid (auto tech category) and NASA's Kepler space telescope (aviation and space category). The TKTS building in Time Square won the engineering category, Bosch's Full Force Technology nail gun the home tech award and the as-yet unreleased Natal picked up the Home Entertainment award. The snappily named Sea-Doo GTX limited is255 personal watercraft got the leisure award, a white powder that purifies water called Steward Advanced Materials Thiol-SAMMS got the Eco vote and last, but not least, X-Flex's blast protection wallpaper – a sticky matrix that holds walls together when they are blown up – won the security award.